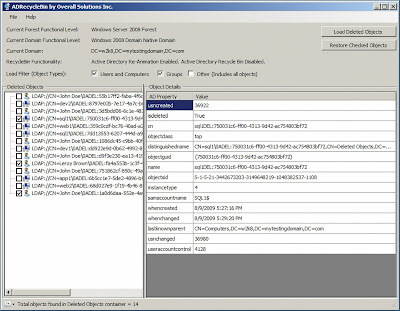 Overall Solutions Inc.'s free tool, ADRecycleBin, connects to the domain controller and shows you the current Forest functional level, the Domain function level, the current domain and what type of RecycleBin functionality is available. For Windows Server 2008 R2, you can tie into the Active Directory Recycle Bin; for earlier versions, you can "re-animate" deleted objects. ADRecycle Bin filters the type of objects you wish to load with three check boxes: Users and Computers, Groups, and Other. Clicking on Load Deleted Objects does just what you'd expect; once your set of tombstones is loaded, you can click on individual AD objects to see the detailed property view of that object, including sAMAccountName, SID, CN, lastKnownParent and whenChanged, among others. Next, just select the items you want to restore and click Restore Checked Objects.